Keep your tie and collar intimidatingly camera-ready with this stylish mens fashion accessory inspired by Percival Graves from the hit movie Fantastic Beasts and Where to Find Them. 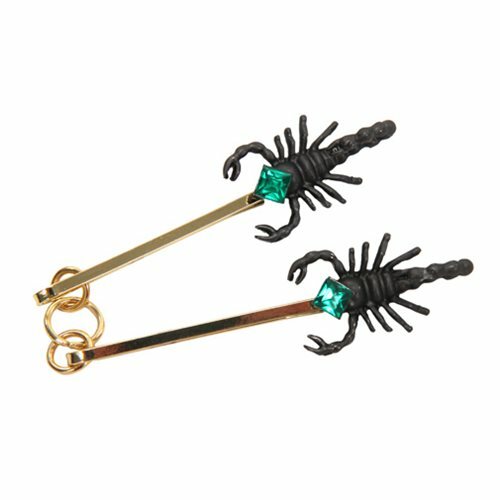 An excellent choice for everyday cosplay and costume wear, these brass pins feature detailed black scorpions inset with faceted faux emerald gemstones. Makes a great gift for fans of J.K. Rowling's Wizarding World! Take the sting out of dressing for wizardly duty with these fiercely fashionable Fantastic Beasts and Where to Find Them Percival Graves Scorpion Collar Pins.